My 2014 World Championships campaign is done and dusted. Last year I finished the 6th above knee amputee across the line. The goal this year was to finish in the top 3. I just managed to tick that box by being the 3rd above knee amputee to cross the line. I finish the 2014 triathlon season ranked 5th in the World for the PT2 class. My goal is to make it to Rio 2016 Paralympics and be ranked 1. I have two year of hard work ahead. I would like to thank everyone in my huge support network. 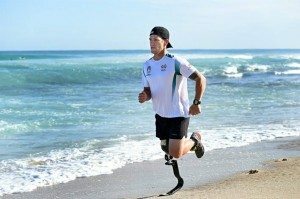 Especially Total Marine Technology, Orthotic Prosthetic Solutions, Wheelchair Sports WA, Star Physio WA, Evolutio and The Running Centre as well as Suredata, Triathlon Australia and WAIS for making this all possible. Family and friends, your support continues to surprise me with kind words and motivational messages that help during the tough times. My Exceed Triathlon Club family. 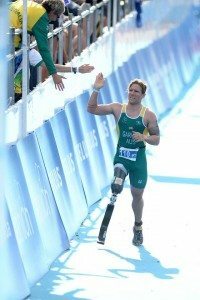 Without you guys I would still be doing Telstra Series triathlons in around 2 hours rather than being the worlds fastest above knee amputee Ironman finisher. Even on the other side of the world you can see two of them giving me high fives in the photo! Sorry, but at the time I was hurting to much to even know who it was. My coach Ross Pedlow for always making sure I’m doing the right things for the long-term goals and not focusing on the quick wins. I’m delighted to be working with Don and the team at StarAmp Global, I’m learning more everyday about the business of sport and through sponsorships & speaking engagements I’m able to share these tips with students and corporates all over Australia. My number 1 fan Natalie. Who has to put up with my selfishness and mood swings while training and working more hours than are available in a week. Also being left at home alone on her Birthday while I was in Canada racing. Whether you know it or not, making it to the Paralympics is going to take an army of family, friends and partnerships. To my army, I say Thank you. We’re not there yet but we are on the way.